Achieve catwalk looks with the Hairaisers volumising hair piece. 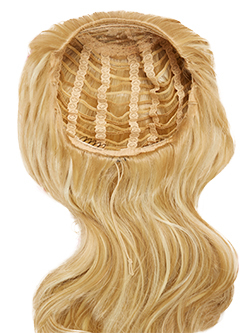 This pre-styled, ready to wear hair piece has a natural soft touch and is light and easy to attach. Hairaisers live it Loud volumising hair piece simply clips over your own natural hair to give you gorgeous long, layered hair in seconds. Wear as a hair piece or a ponytail, seamlessly blending into your own hair. Available in two ready to wear styles 22” straight or 22” glamorous curl. Both with a durable lace cap which prevents shredding. Premium quality high-heat fibre can be heat-styled up to 180 degrees so you can straighten, curl and style any way you want. Performs like a full head of weave hair extensions at a fraction of the price. Be your own celebrity stylist using our Live it Loud volumising hair pieces. Extra Long Celebrity Style in 5 Minutes or Less!! Developed as a low-cost, high-quality alternative to long human hair extensions the Live it Loud straight hair pieces provide instant length and volume faster and cheaper than clip in’s or weft. Like natural hair, your high heat fibre straight hair piece needs to be cleaned after prolonged use. * Dilute 1oz of Hairaisers Shampoo for fibre hair in a bowl of lukewarm water. * Gently sponge the shampoo into the hair and rinse thoroughly ensuring you remove any excess shampoo. * Do not use a rubbing or circular motion as this can matt and tangle the hair. * Apply Hairaisers Conditioner for fibre hair and then rinse thoroughly in lukewarm water until the conditioner is removed. * Finally rinse in cold water. * Pat dry with a towel. * Do not use any strong or vigorous motions. * Leave to fully air-dry. The 22 Inch Glamorous Curl Live it Loud Volumising Hair Piece and Ponytail is pre-styled and ready to wear. Each hair piece is manufactured using superior quality high-heat fibre rated to 180 degrees and can be styled using tongs, straighteners and hair dryers that do not exceed 180 degrees heat. You can return your hair piece to Hairaisers only under the following conditions. The product and packaging are perfect and unused. The product has not been removed from the packaging save to check the colour. If you find your product is not the correct colour to match your own hair you can exchange the product for another colour. You cannot ask for a refund unless the product is proven to be faulty.